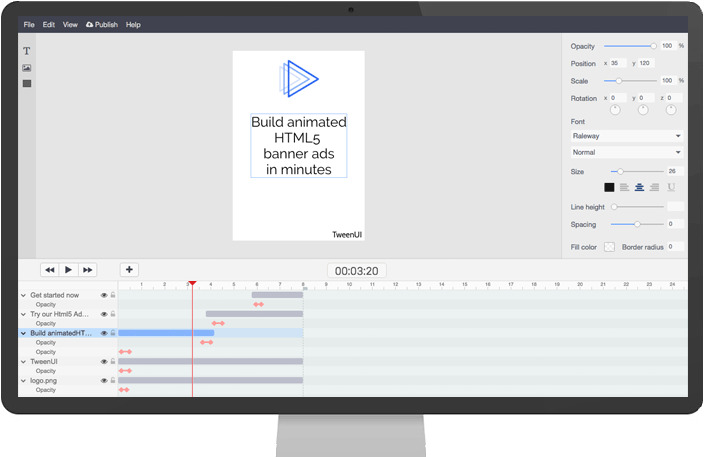 Create animated banner ads that converts users into customers. Export for Google Ads, Facebook Ads, Sizmek and other popular platforms. Our tool use advertising industry standards so you can easily export and upload directly into any campaign. Build professional banners in multiple formats and sizes with minimal effort and start attracting new customers. All banners built with our editor can scale-to-fit and maintain aspect ratio out of the box. Update text and images dynamically with our feed solution. Scale up your ad production effortlessly by using template banners. Making last minute adjustments has never been easier. Just open, edit and re-publish your banner, and the change is live. With our editor you can do much more than simple entry/exit animations. Combine any animation, any number of times. We support all the standard formats. Download your banner as Html5, AMPHTML, MP4 video or animated GIF. Upload and use any TrueType or OpenType font. To minimize size, only characters that are used will be included in the final banner. Our editor does all the heavy lifting and lets you build professional animated banner ads without writing a single line of code. Use our Cloud Publish feature to keep full control over your ads. Give the ad-tags to publishers and update the creative any time.